In Student table RollNumber is a primary key. Create a new project. 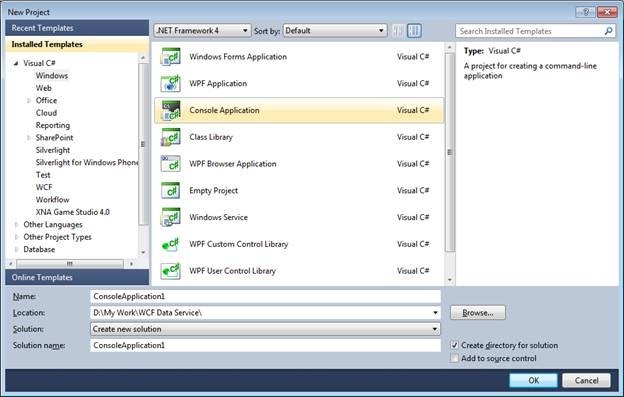 Select the project template Console Application from Windows tab. 1. 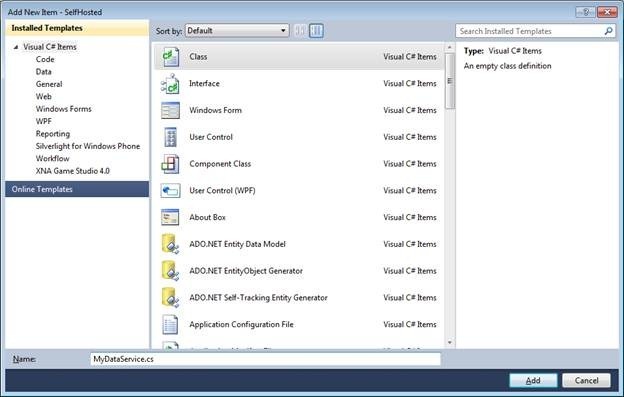 Using ADO.Net Entity model. 2. 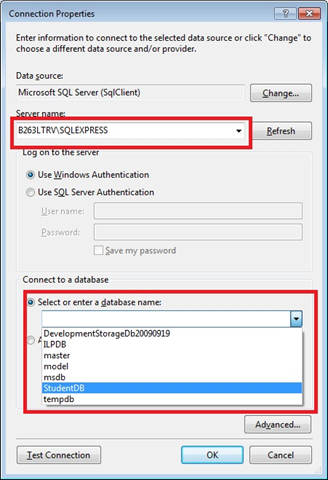 Using LINQ to SQL class. 2. 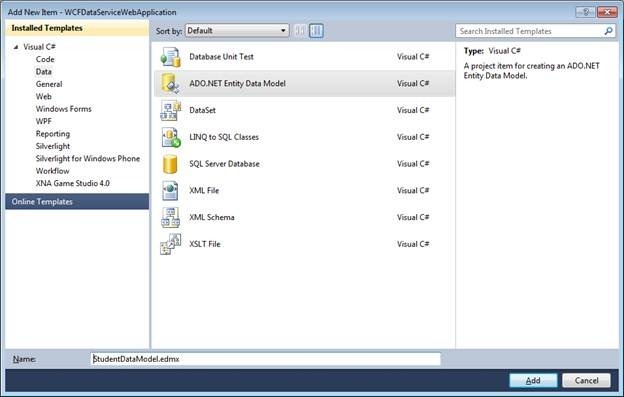 Select ADO.Net Entity model from Data tab. 3. Since we have table in data base. So we are going to choose option, select from database. 4. Either choose the data base from drop down or create a new data connection. In above connection string StudentDBEntities is name of the connection string. If we want, we can change this connection string as per our requirement. You can give the data base server name and press refresh. After pressing Refresh, you can choose the data base from the drop down. 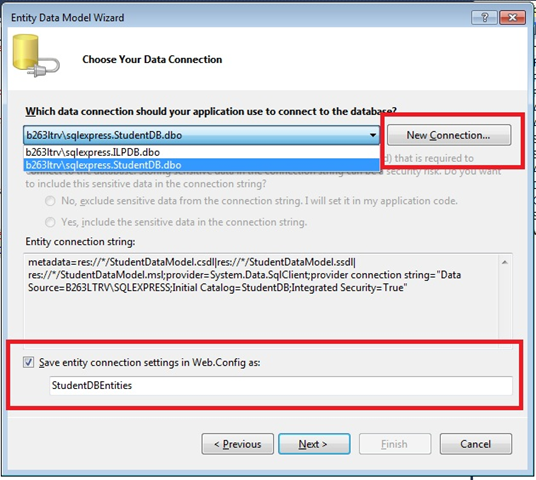 After selecting the data base click on Test Connection to test connection established successfully or not? 5. 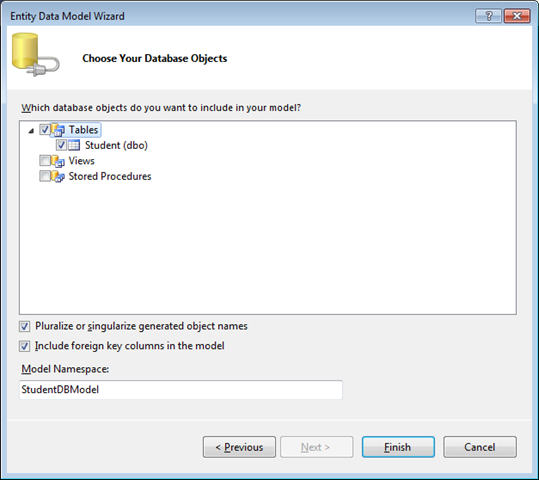 Select tables, views and stored procedure from data base you want to make as the part of your data model. Since we are having only one table so we are selecting one table. If you want you can change name of the data model. By default it is name of the data base appended by the term model. 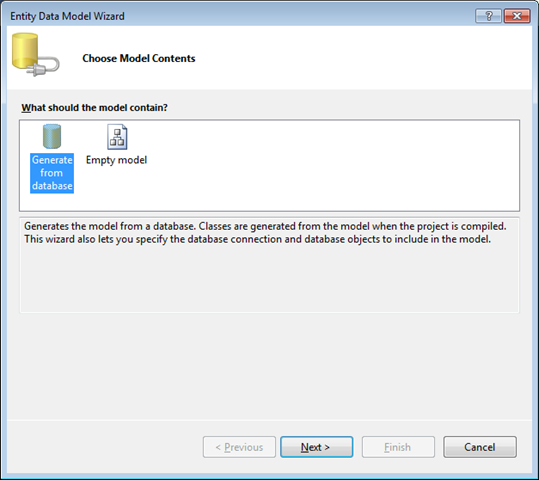 Click on Finish button to complete and create the data model. 6. 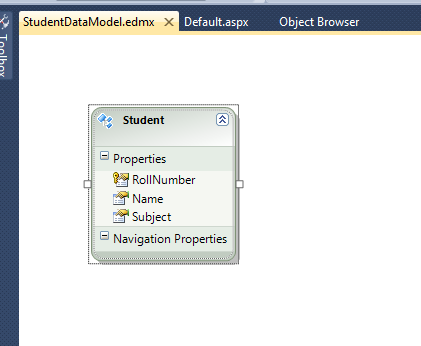 Now we can see that StudentDataModel.edmx has been created in the designer. Since there is only one table, so there is only one table model at design surface. Now we have created the data model which can be exposed as WCF Data Service. 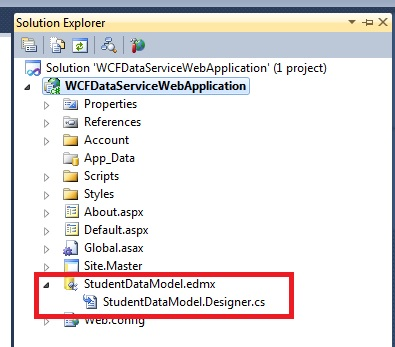 Now you can see in solution explorer, you have StudentModel.edmx and StdentModel.Designer.cs files. Right click and add a class in console application. I am giving name here MyDataService to the class. In this step we will create WCF Data Service class. 1. Make the class as public. 1. Create instance of WebServiceHost. 2. Create instance of WebHttpBinding. Just press F5 to run the WCF Data Service. Data Service will be hosted in the console application. So, we are able to run the WCF Data Service and this service Is hosted in console application. We can consume the service in any client in the same way; we consume WCF Data service hosted in any other web server. I hope this post was useful, thanks for reading. Happy coding.